JOHANNESBURG -- Assailants in South Africa attacked a top national triathlete who was cycling to a training session and cut into his legs with a blunt saw, causing severe injuries, an athletic director said Wednesday. Mhlengi Gwala, 27, was undergoing surgery after the attack which occurred before dawn on Tuesday in the coastal city of Durban, said Dennis Jackson, director of the elite athlete program for KwaZulu-Natal province. 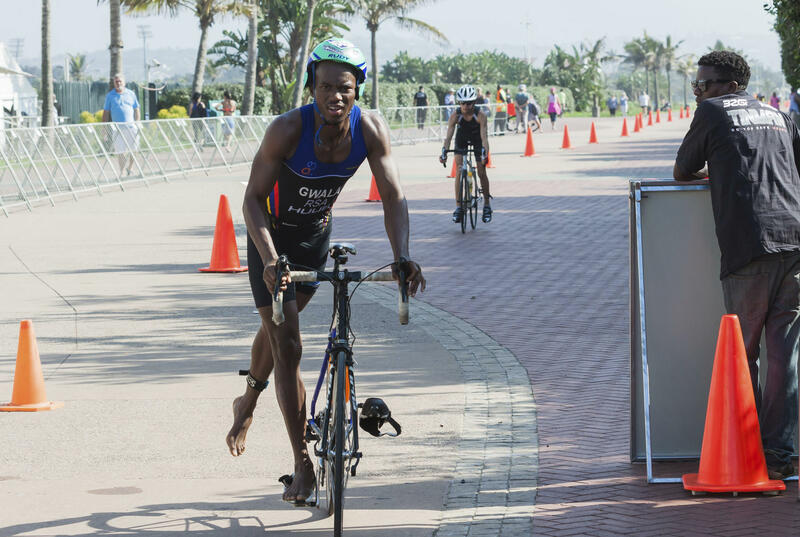 Several attackers pulled Gwala off his bicycle as he cycled up a steep hill and sawed into his right calf, damaging muscle, nerves and bone, according to Jackson, who spoke by phone to the triathlete about the ordeal. They missed a main artery and surgeons are confident they can save the leg, Jackson said. The attackers also started sawing into Gwala's left leg before fleeing, enabling the athlete to crawl to a road and flag down a passing car to take him to a hospital. The grisly attack has alarmed athletes in Durban who routinely get up in the early morning darkness to train when few people are on the roads, and there was no immediate explanation for why Gwala was targeted. The athlete had offered his cell phone, wallet and bicycle to the assailants, who still went for his legs and were speaking in a language that Gwala could not understand, Jackson said. "I have never heard of any enemies that he may have," he said. "He is a wonderful ambassador for the sport." Gwala became an excellent athlete after overcoming drug and alcohol addictions, representing South Africa at international competitions in Chicago in 2015 and in the Netherlands last year, Jackson said. The athlete's long term goals were to compete in half and whole ironman triathlons, which include swimming, cycling and running. South Africa's deputy sports minister, Gert Oosthuizen, described the attack on the "star athlete" as "totally unacceptable" and said police are investigating. A friend of mine, cycling in the Durban area was robbed by three people this morning, Then they attempted to saw off both legs with a chainsaw. Blade too blunt and only got half way through one and started on the other. Absolutely disgusting! How safe are we on SA roads? Triathlete Henri Schoeman, who won bronze for South Africa at the Rio Olympics in 2016, said he wishes Gwala the best on his path to recovery. "How safe are we on SA roads?" Schoeman said on Twitter.